NOW, THEREFORE, it is deemed necessary, as a permanent measure, to establish a forum and provide a platform to enable the professional economist and the policy-makers to exchange ideas on the pressing economic problems facing Pakistan on a continuing basis, and to draw potential benefits from a dialogue between the Institute, government and semi- government agencies as well as private research organizations. In order to achieve this purpose, the Board of Governors of the Applied Economics Research Centre, University of Karachi taking into account the recommendation of the Council of Senior faculty of the Applied Economics Research Centre, University of Karachi, having met at Karachi, hereby decide that a PAKISTAN SOCIETY OF APPLIED ECONOMISTS be organized within the framework of the 1996 Statutes of the Centre under the Constitution set forth below. 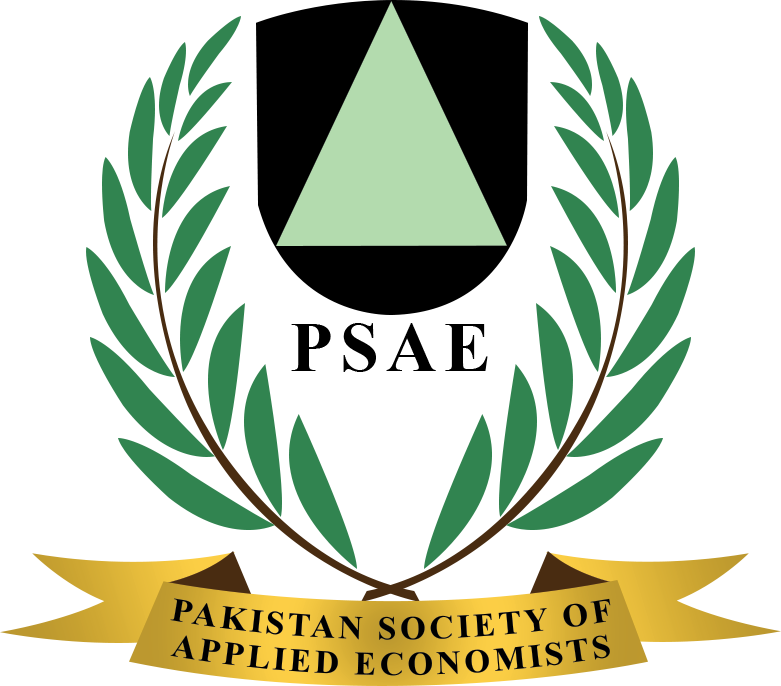 The name of the Society shall be the Pakistan Society of Applied Economists. The registered office or the Society shall be located at the Applied Economics Research Centre, University of Karachi. The Society may have local chapter s located at suitable places inside Pakistan. 3.1 The “Society “means the Pakistan Society of Applied Economists. 3.2 The “Centre” means the Applied Economics Research Centre. 3.3 The “Governing Council” means the Governing Council of the Society. 3.4 The “Executive Council” means the Executive Council of the Society. 3.5 The “Patron in-Chief,” President”, “Vice President “,”Secretary” and ‘Treasurer” means such officers of the Society. 4.1 The principal object of the Society is to strengthen the process of evolution of scientific knowledge in Applied Economics by providing a Forum for exchange of ideas between the Centre and development economists outside the Centre. (e) Do all such things as are conducive to the attainment of the above-mentioned objectives. (e) all professional staff in the research and training wings of the Centre. 5.2 Honorary Life Member ship: The Executive Council may, of its own accord, confer Honorary Life Membership of the Society on persons who have made outstanding contribution to the growth of knowledge in areas specified in Article 5.3(b) below. (b) Master’s degree in Economics, Business Administration, Public Administration, Agricultural Economics, Statistics, Econometrics Economic, Demography and/or an evidence of pr oven scholar ship in these areas of specialization. (c) Institutional Membership: The institutional Member ship shall be against an annual fee of Rs 2000.00. The member institutions shall nominate two qualified members of its staff to participate in the meetings held by the PSAE. (d) Life Membership: The Life Member-ship to individuals on payment of Rs 10000.00 by Pakistanis and US$ 2000.00 by overseas shall be allowed. 5.3 may apply for Member-ship on the prescribed form after having their nominations duly proposed and seconded by any two Ex-officio Members/ Members of the Society, provided that no shall be required of a member of the Society who may enroll as Member on payment of the prescribed fee at the invitation of the Council. Election to Membership shall be decided by a simple majority of the Executive Council at a constitutionally valid meeting. 5.6 Termination of Ex-officio Membership: A member shall cease to be an Ex-officio Member of the Society on termination of his association with the Institute in such capacity as entitled him to the Ex- officio Membership of the Society. 5.7 Resignation of Member: Any Member may at any time file his resignation in writing with the secretary of the Society. 6.1 Governing Council: There shall be a Governing Council of the Society to oversee the operations of the Society and to keep a watch on its progress. 6.3 A member of the Governing Council shall cease to be a Member of the Governing Council on the termination of his association with the Centre which entitled him to be a Member of the Board of Governors of the Centre. All remaining Members of the Council of Members Senior Faculty of the Centre. 6.5 A member of the Executive Council shall cease to be a Member of the Executive Council on termination of his association with the Centre that entitled him to have Membership of the Council of Senior Faculty or the Ex-officio Membership/Membership of the Society. 6.6 The term of office of the Members on the Executive Council shall be two years; No Member shall serve on the Council for two consecutive terms. (b) be ineligible for election to the second consecutive term except when there is only one Senior Faculty from any of the local chapters of the Society. (c) Be a member of the Council of Senior Faculty. (e) Cease to be a Vice-President on the termination of his association with the Centre in such capacity as entitled him to the ex-officio member ship of the Society. (c) cease to be the Secretary on the termination of his association with the Centre that entitled him/her-to the Ex-officio Membership of the Society. (c) make payments through imprest money or crossed cheque against vouchers, bills, etc., countersigned and attested by the Treasurer and duly passed by the President. (f) complete accordingly all the account registers and present the same to the President for countersignature. exercise all such powers and perform all such acts as may be necessary for promoting the interests of the Society. Functions and Powers of the Executive Council. recommend outstanding scholars for an appropriate award for their contributions in the field of Development Economics. 10.1 The President shall be the operating Chief of the Society. He / She shall exercise all such powers as may be delegated to him by the Governing Council or the Executive Council to ensure smooth conduct of the business of the Society. 10.2 The President shall appoint the Secretary and Treasurer of the Society. 10.3 The President shall set the date and the venue of the Annual General Meeting of the Society. 10.4 The Vice-Presidents shall perform such functions as may be delegated to them by the President. 10.5 The accounts of the Society shall be maintained by the Treasurer. 10.6 The Secretary shall conduct all routine operations under the direct guidance of the President. He/she will issue notices, prepare and circulate the agenda of the meetings, record the minutes of the rneetings, fix the price of publications of the Society and carry on the correspondence of the Society in accordance with the policy of the President. 11.1 Proceedings of the Annual General Meeting and Occasional Papers, edited jointly by the President and the Secretary of the Society, will be published by the Society. The fee would include subscription to the papers and proceeding issue of the PJAE, which is published version of the presentations in the PSAE’s Annual General Meetings. It shall be payable in advance each year. (a) Government grants sanctioned annually, on the recommendation of the Board of Governors of the Centre. (b) Sale or royalties of publications of the society. (c) Fees paid by the Members of the Society. (d) Gifts and endowments made to the Society by different national and international agencies. (e) Any other source duly approved by the Governing Council of the Society. 14.1 The Accounts of the Society will be subject to the normal audit procedure. 15.1 The Governing Council shall meet at least once a year. Its meetings will be convened by the President of the Society in consultation with the Patron-in-Chief of the Society. 15.2 The Annual General Meetings of the Society shall be held, under the aegis of the Centre, at its registered address and, by rotation, at all local chapters of the society. 15.3 The notice for Annual General Meeting shall be mailed by the Secretary to Ex-officio Members, Honorary Life Members and Members at least fourteen days prior to the Annual General Meeting. 15.4 For holding the meeting of the Executive Council, a minimum notice of fourteen days shall be required. The Secretary of the Society shall issue the notice after its approval by the President. 15.6 One-third of the members of the Executive Council shall Form the quorum for its meeting. 16.1 This Constitution or a part thereof may be amended by resolution passed by a two- third majority of the members constituting the Executive Council at a constitutionally valid meeting and with the consent of the Governing Council. 17.1 The Society may be dissolved by a resolution passed by three-fourths of the total number of members constituting the Executive Council only at a full session of the Council. This decision will not be effective unless it is ratified in a full session of the Governing Council by at least three-fourths of its members.